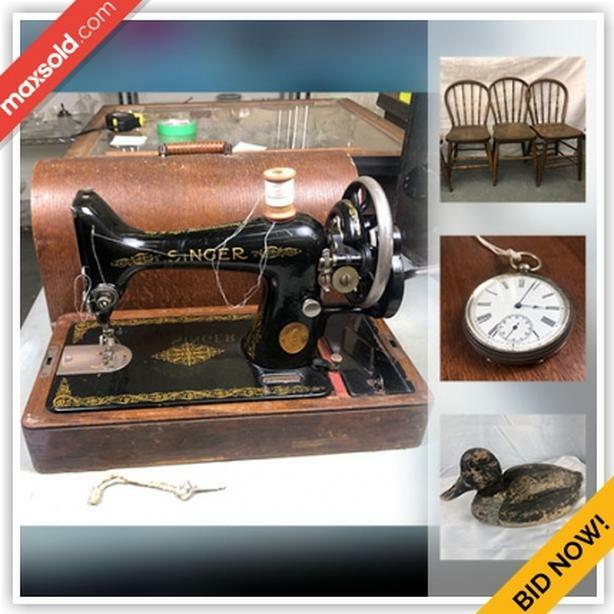 This online auction features solar antique pocket watches, sterling, antique latch sets, coins, road signs, early milk glass jars, vintage tins, etched glass, depression glass, cornflower crystal, antique pictures, needlepoint, bakelite carver set, sewing machines, childrens sewing machines, antique walnut woo teacart, vintage utensils, sterling pendants and jewelry, wood pedestal, murano glass, antique wood planers, carved axe, binoculars, horse lamp, purple amethyst canning jar, anniversary clock, Majolica dish bowl, antique duck decoy and much more! Please view catalog and pictures online at MaxSold (https://maxsold.maxsold.com/auction/14958?utm_source=Used&utm_medium=post&utm_campaign=London-FirstStreet). Everything will SELL BY Thursday April 18, 2019 8:30 PM regardless of price - everything starts at just $1. For more information, please visit our website.